Join us on Thursday, October 25th for ‘Good to Great’, the inaugural Football for Good Gala, as we celebrate FFG’s first global scholar. Featuring: TSN’s Kristian Jack & Steven Caldwell. And, an acoustic performance from Canadian recording artists, Bedouin Soundclash. 100% of all ticket sales to support Football for Good in Uganda. You will be redirected to PayPal to buy your tickets. After your purchase, your PDF tickets will be sent to you by email. Along with a host of special guests, you will have an opportunity to meet FFG’s first international scholar, Geoffrey Ogenrwot. 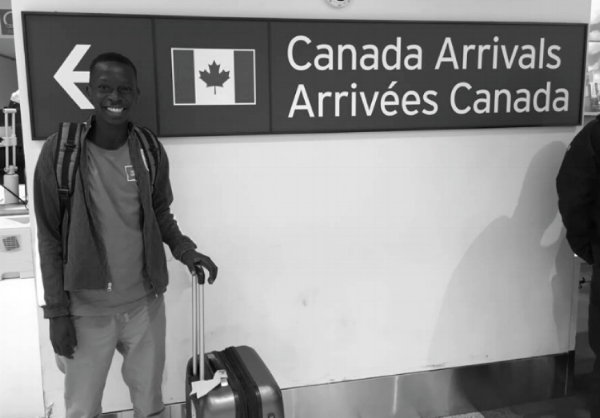 From rural northern Uganda to Aurora, Ontario’s St. Andrew’s College, Geoffrey will share his story and the new journey he is about to embark on — from ‘good to great’. FFG founder Adrian Bradbury will also be on hand to bring to life the ups-and-downs of FFG and life in Uganda. He will also share the successes and challenges that he’s encountered in the first four years of seeding Uganda’s only full-time youth football academy and scholarship program. The evening will also feature TSN’s Kristian Jack & Steven Caldwell. And, an acoustic performance from Canadian recording artists, Bedouin Soundclash. The interactive event will include the sights and sounds of Uganda, starting at 5:30pm with the reception. After some mixing and mingling, the evening will move into a light dinner and storytelling at 6:30pm, followed by the after party. We look forward to seeing you at FFG’s first-ever gala event! Your ticket, for just $100, includes an amazing and intimate evening of entertainment, storytelling and conversation, along with a light dinner and an open bar — courtesy of our event hosts at PUBLIC Inc.
Football for Good (FFG) is already being recognized as East Africa's top full-time youth football academy and scholarship program. FFG now has a national training centre in Kampala and a regional training centre in Gulu, which provides the best young boys and girls with a scholarship that gives them full-time football training, international coaching and exposure, as well as an exemplary academic and character development program. Over the past four years, FFG has scouted over 20,000 young players to select the 40 that now make up the elite academies. In September, FFG sent their first young player on a professional contract to Europe and their first international scholar, Geoffrey Ogenrwot, on a full scholarship to Canada’s St. Andrew’s College — who you will meet on October 25th at the FFG Gala! And, starting in October, the FFG U15 squad will be youngest group to play in the FUFA Juniors League, Uganda's only elite U19 national league.